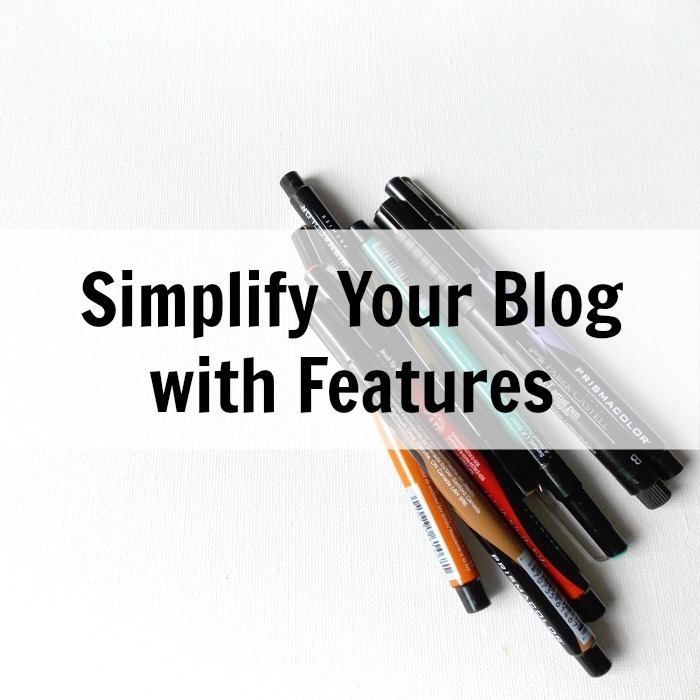 Features simplify your blogging routine. I first heard about features almost four years ago from Elsie Larson's course, Blog Life. The features idea connected with me and I incorporated a system for this blog. I designate a certain type of post for each day. I usually post M, W, F. On Monday, I post about capsule wardrobes or outfits ideas. Wednesday, I post tips and Fridays are dedicated to personal growth. A feature is something that has a form but is ever changing. It's like a column in magazines ~ always there but ever-changing. Features can be a list: outfit of the day, favorite ________ (things, books, blog posts, movies). Or they can be roundups of: posts, recipes, instagram photos. These are examples of features that have form but can be changed weekly and present themselves as a fresh new article. Recurring features help you know what you need. You'll know what photographs, links and research to do. Your features need to be a topic you LOVE! Otherwise it will get tedious and boring. I absolutely love creating outfits and sets of clothes each week. It gives me a burst of creative pursuit and I get to work with new clothes without spending money! It hones my skill of helping others with their wardrobes because I practice with new sets. My other features are a bit more loose. Giving tips leaves it open enough for me to not feel trapped but formulated enough that I can pull a post together fairly easy. Under the umbrella of TIPS, I have shared how to create a capsule wardrobe, meaningful gift ideas and now blogging help. I tend to be a how-to junkie, so sharing what I'm learning along the way reinforces what I'm doing. It's a joy for me to share tips with others. This comes naturally in life so it makes sense that this would spill over into my blog posts. Make a feature out of something you share naturally in life! The last feature I share on Fridays, is more about personal growth. This began because I love sharing my process with others and being held accountable. A community full of honest seeking people is important to me. I realized that to build community with others, you have to be vulnerable and open. I wanted a place to share my deeper thoughts, personal growth and what I'm struggling with. I wanted a space for us to grow together; a place for others to gather around because they're struggling too or have encouragement to give. So I created this feature to publish right before the weekend ~ a relaxing conversation over coffee or wine. Your features should reflect what is valuable to you. Not everyone has features for every time they post; some people prefer the spontaneity of writing miscellaneous articles. You can choose to have one feature or many; they can even revolve. I've seen blogs that have features for the first of the month or every other Friday. Use this tool to reduce the stress of trying to pull a post out of thin air. What features have you seen and really enjoyed? What features would you like to create if you had/have a blog? Me too, Jamie! I'm cleaning out my kitchen and getting rid of MORE STUFF that I won't have to clean. So happy this helped; I'll look forward to reading!